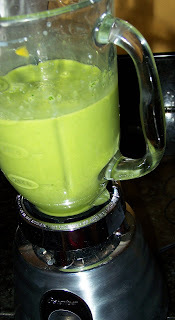 I thought I would share a couple of other green smoothie recipes and also some quick frozen banana recipes. Whenever my bananas are getting too ripe to eat, I freeze them. Usually I just divide the banana into about 4 chunks and put them in a container in the freezer. Most of the time I use the frozen bananas for Breakfast Ice Cream. This is a Sneaky Chef recipe that I modified slightly. Place all of the ingredients in a small food processor and blend until smooth. This is a yummy treat. I save this for extra grumpy mornings. I also give it to my kids for dessert sometimes. This recipe makes a pretty small serving. You can always double or triple the recipe. You can also slice a banana into slices like chips and freeze them on a cookie sheet. My kids gobble these up. Since they are frozen, they think they are getting a treat. I have had several comments on my green smoothie recipe so I thought I would share a couple more of my variations with you. This one is not as healthy, but it will satisfy that chocolate craving and you still get some spinach. This is a good one to do if you are watching your calories.